After our ordeal with the bus we spent the following day relaxing and chilling by the pool. 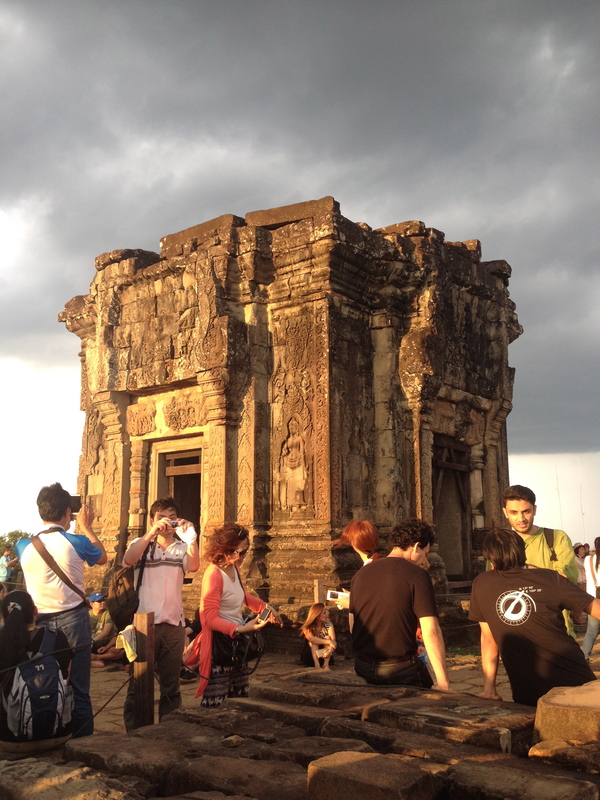 We took a tuk tuk just before sunset and went to one of the temples at Angkor. 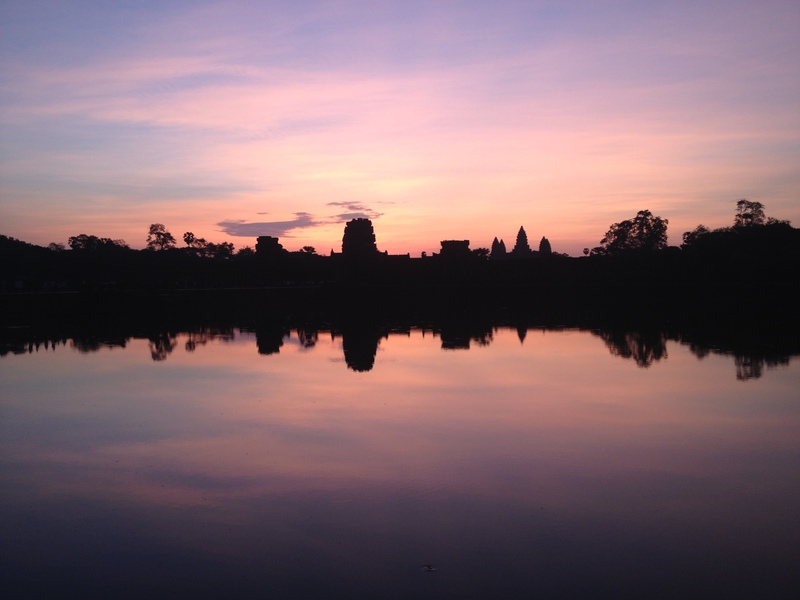 If you buy a one-day ticket to Angkor Wat after 5pm you’re allowed access to the complex to watch sunset at one of the temples as well as the ticket being valid for the following day. We thought we were being original watching the sun go down at Phnom Bakheng but it appears everyone had the same idea… there were hundreds of people perched on the top of the temple for sunset. Unfortunately the rain wasn’t waiting for the sun to go down and as soon as it started raining… the masses started leaving, leaving us to take in the view by ourselves. We woke up bright and bushy tailed the following morning at 4.30am to be picked up by Mr Raya, our tuk tuk driver, for sunrise at Angkor Wat. Again, there were thousands of people standing across the moat from Angkor Wat waiting for the sun to rise. Despite all the people outside the temple, there were very few people inside the temple after the sun had actually risen. Walking around the temple complex left you in awe. 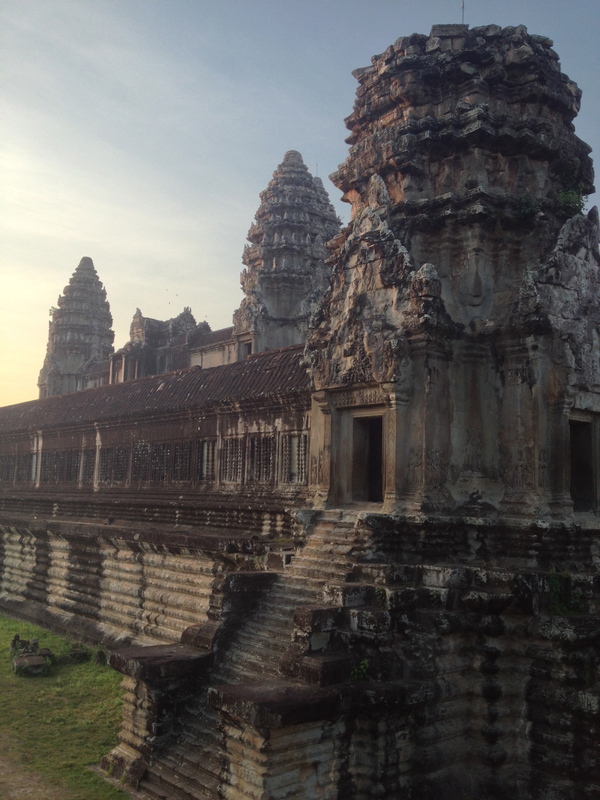 Angkor Wat was actually first a Hindu and then a Buddhist temple, and is the largest religious monument in the world. 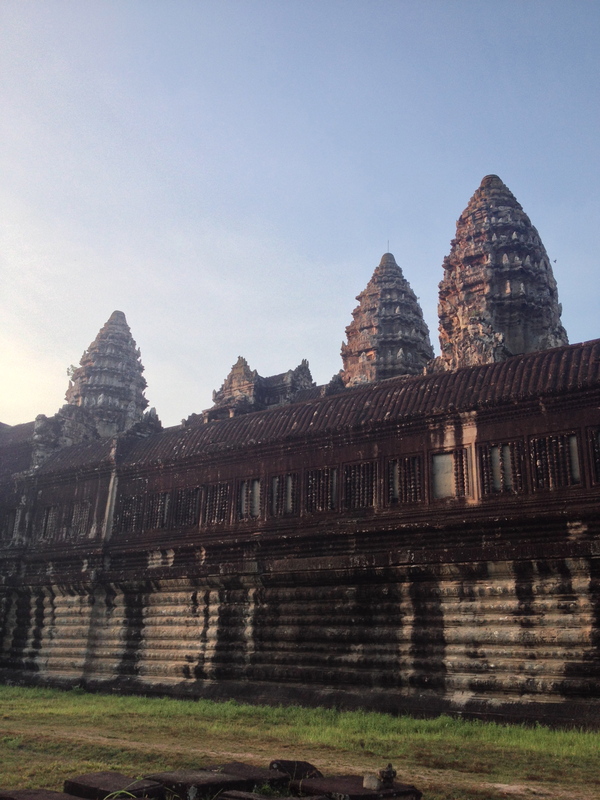 The temple is a classic example of Khmer architecture and has 5 massive lotus-like towers made of sandstone. It was incredibly beautiful and peaceful watching the sun come up over the lotus-like towers. Unfortunately the tranquility and beauty was somewhat ruined by the masses of hawkers inside Angkor Wat trying to sell you anything and everything. We saw one German tourist being repeatedly bothered by a hawker trying to sell him an Angkor Wat guide. The tourist kept saying no and eventually lost his patience, so the hawker deliberately kept trying to piss him off on purpose – we watched the hawker follow him around the temple for at least 10 minutes trying to get him to buy the guide. Also, you’d walk into some dark parts of the temple to find people holding out incense sticks and saying ‘this is for Lucky Buddha’ or ‘Good Luck from Buddha today’, luckily we’d read all about the scams that go on inside Angkor Wat and knew if we took an incense stick they’d then try and make you pay $10 or some other ridiculous amount. There’s no way to stop the hawkers unfortunately because Cambodians are allowed to visit and be at the Angkor complex for free – only foreign tourists have to pay. After watching sunrise at Angkor Wat, we found Mr Raya and went to Angkor Thom City, the last capital city of the Khmer Empire. In an area of 9km there are numerous temples and religious monuments. 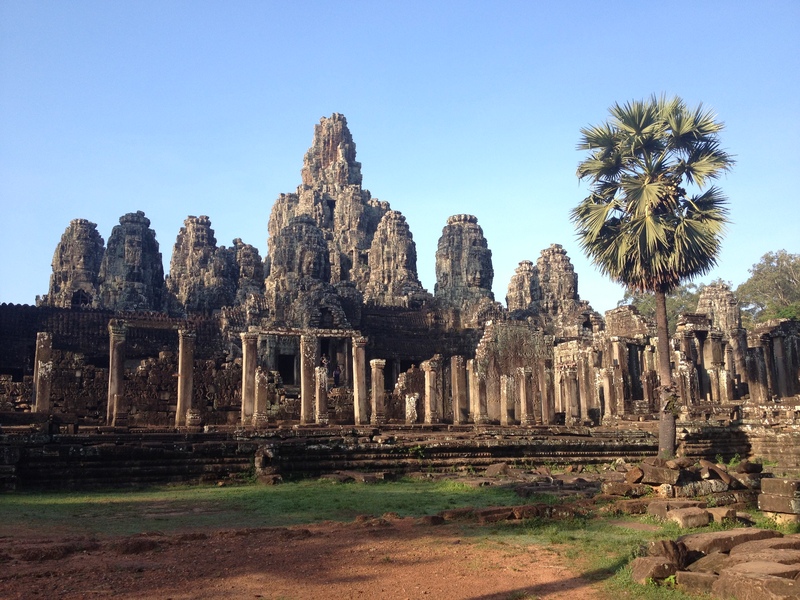 The first temple we visited in Angkor Thom City was Bayon and it was very striking because of the 216 stone faces in the towers that jut out from the upper terrace. 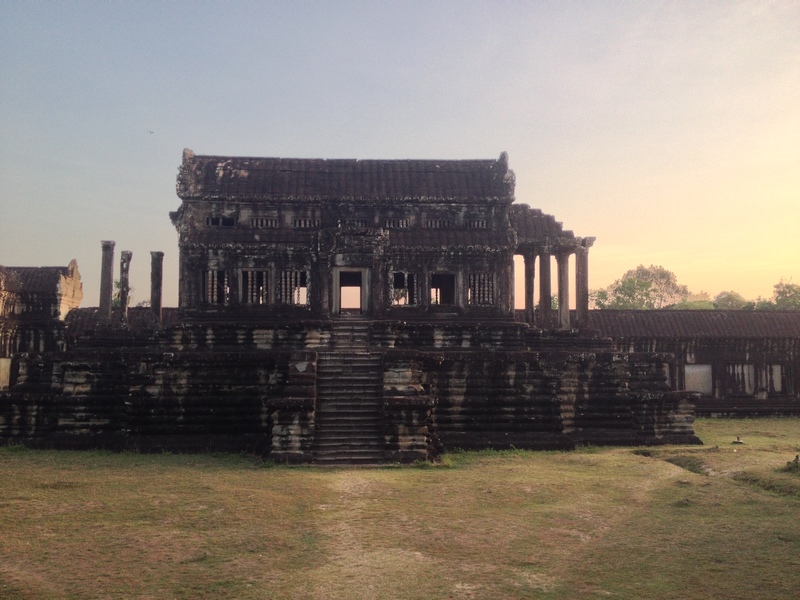 This temple was more ‘baroque’ than Angkor Wat’s classical architecture. This is also the only temple that was built as a Mahayana Buddhist shrine dedicated to Buddha – the other temples were originally Hindu temples. 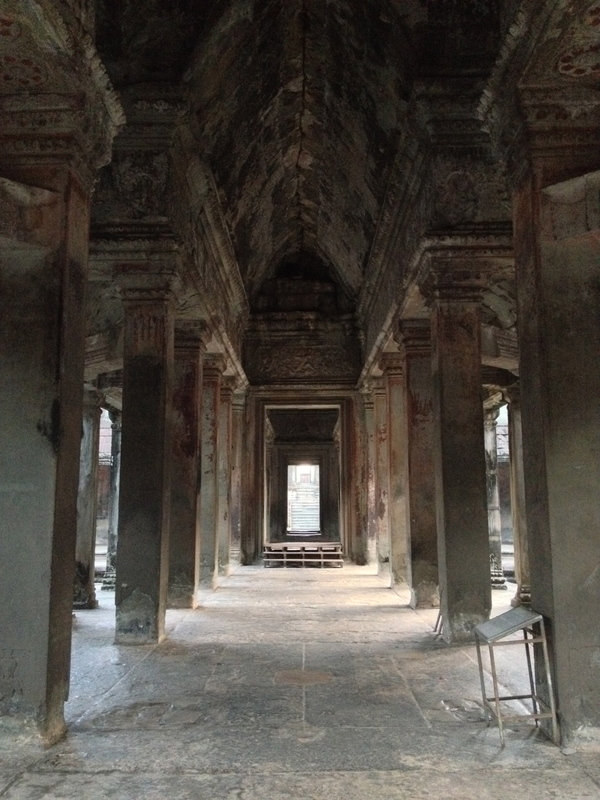 The 216 faces in the temple are apparently meant to be interpretations of King Jayavarman VII. On the walls outside the temple there were various historical scenes and scenes of every day life of the Angkorian Khmer carved into limestone such as the Khmer Army marching into battle. 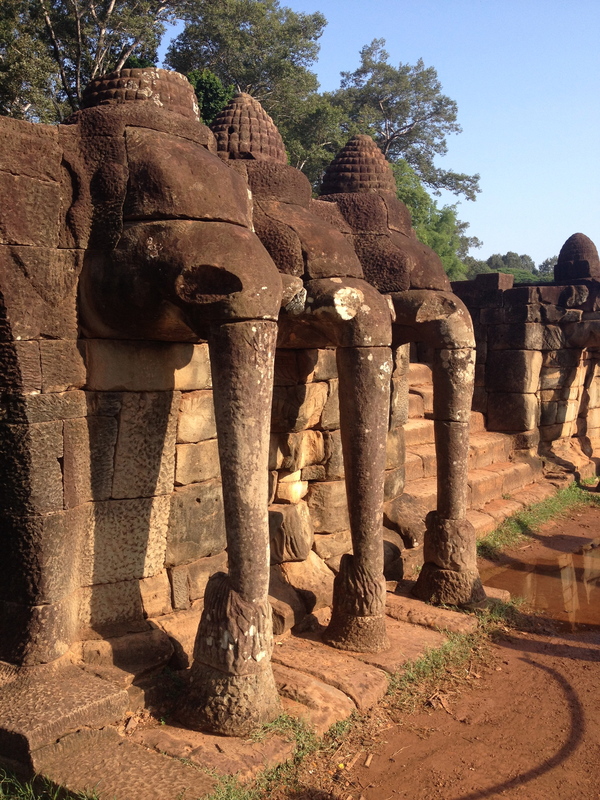 We then walked to the Terrace of Elephants, which was a former temple but there are only a few ruins left. 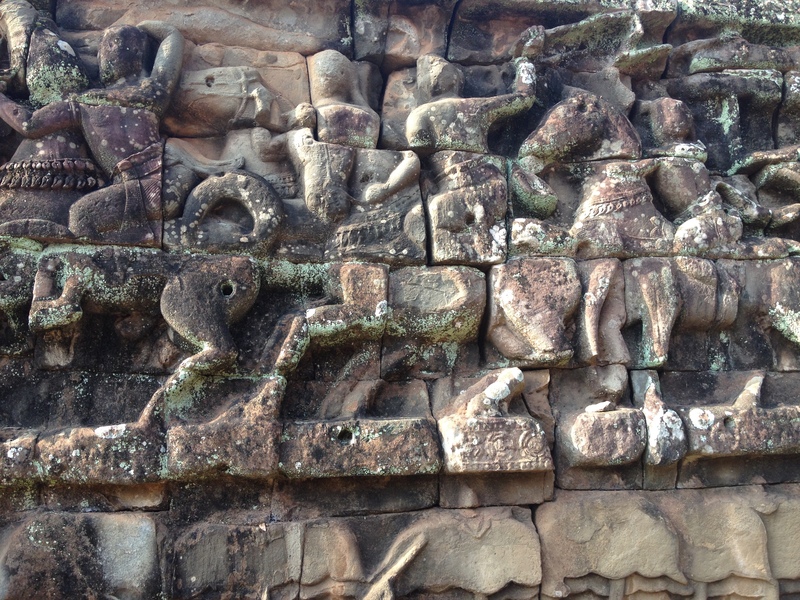 The last temple in the Angkor Thom City complex was the ‘Terrace of the Leper King’. 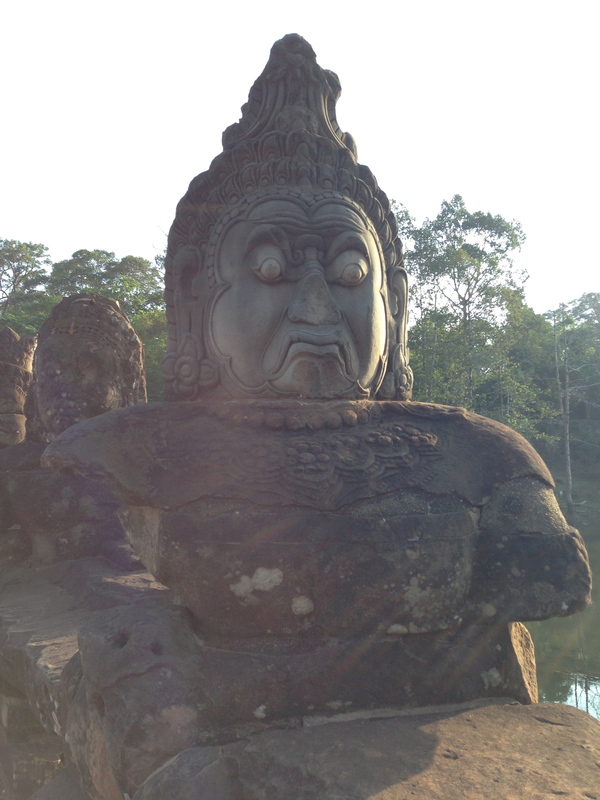 On top of the temple was a statue of the Hindu God Yama, the god of death. The statue is called the ‘Leper King’ because it’s discoloured and covered in moss, so it apparently looks like someone with leprosy. After exploring the temples of the city of Angkor Thom we decided it was high time for breakfast, so we stopped at one of the many restaurants inside Angkor for a bite to eat. We offered to buy Mr Raya breakfast but he said he’d already eaten and had a coffee instead. Mr Raya sat with us whilst we ate and told us about his life and family. He used to be in the Cambodian Army but now worked as a tuk tuk driver to earn a living. He explained that tuk tuk drivers could earn more money than any other skilled job in Cambodia. A seamstress earns about $70 a month, whereas he could earn at least $30 a day at Angkor Wat (we were paying him $15 to drive us around for the day). He explained he had to work as much as he could so he could pay for his children to go to school. It’s crazy that we can easily spend $70 in 2 or 3 days here, but that’s the monthly minimum wage for some Cambodians – I’ve never felt more grateful for where I come from and for the life I’ve lived. 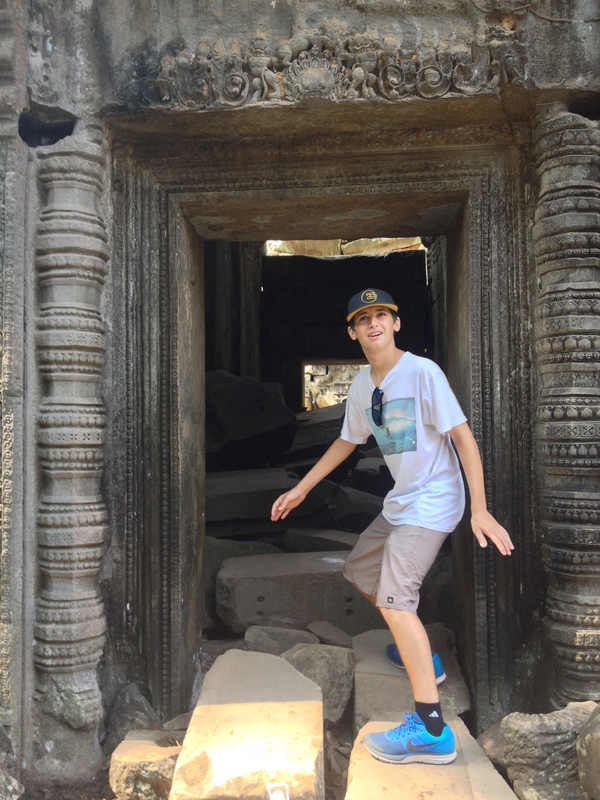 We then got back into the tuk tuk to visit the Ta Prohm temple aka the ‘Tomb Raider Temple’. It was a really interesting temple because there were trees growing out of the ruins and it was being taken over by the jungle. Ta Prohm was made famous by the film ‘Tomb Raider’ so there were hundreds of people at the temple. 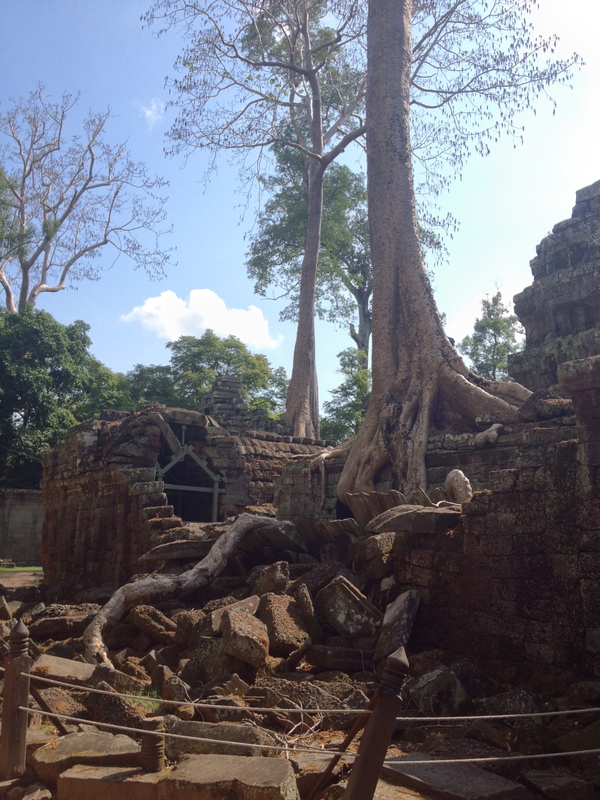 It was by far our favourite temple because the trees growing out of the ruins gave it an eerie feel. The temple looks like soon it’ll be completely taken over by the jungle. Kyle pretending to be Tomb Raider. 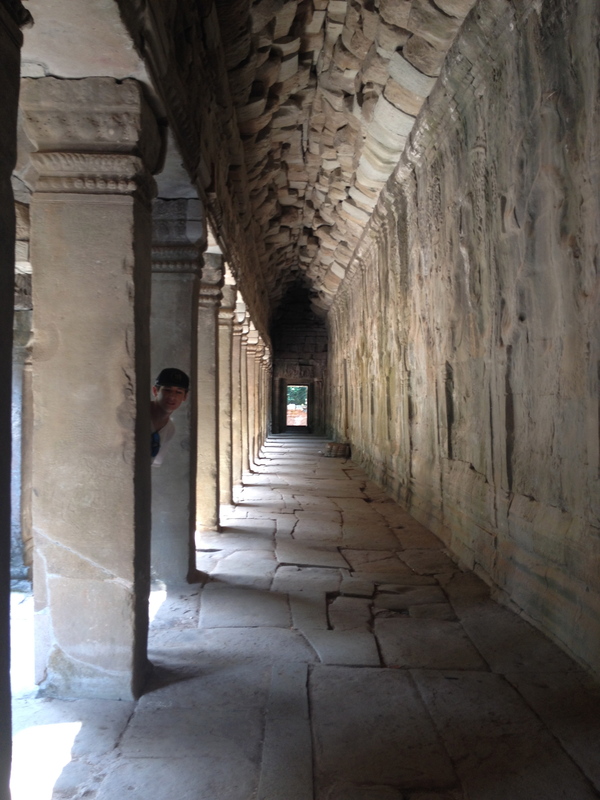 Our last and final temple at Angkor was Banteay Kdei or the ‘Citadel of Monks’ cells’. 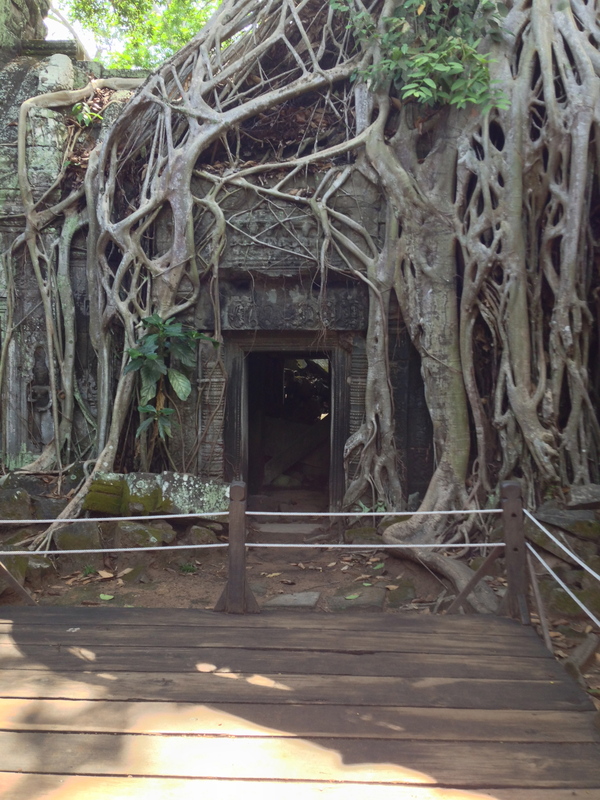 The temple was architecturally similar to Ta Prohm temple without all the trees. The temple was was full of hawkers trying to sell you drinks, books and lucky Buddha incense. Some tourists avoided parts of the temple because they could see there were loads of hawkers waiting inside trying to scam you, which I thought was a shame. 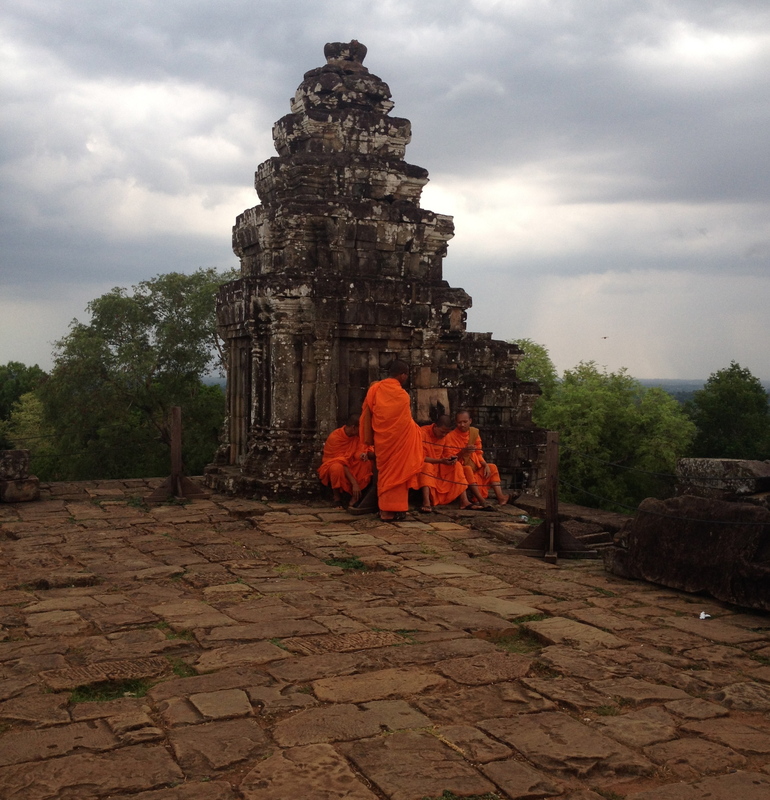 There were also ‘Official Tourist Guides’ just wandering about the temple offering tours for $10 for 30 minutes. We heard one ‘Official Tourist Guide’ taking a group of people around the temple and everything he was saying he’d made up. It’s a shame that these people have to scam people just to make a couple of dollars. 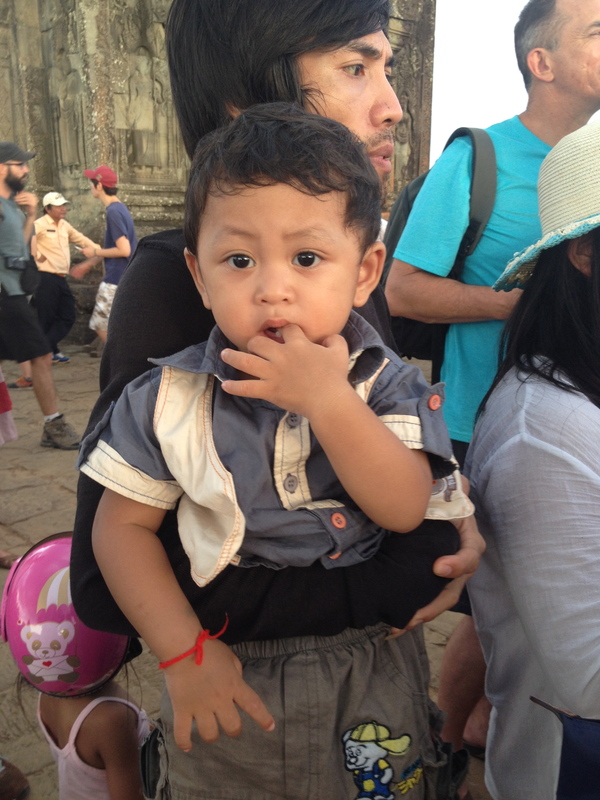 All in all we had a great day at Angkor Wat and loved exploring its temples. It was a real shame though that the temples were full of hawkers trying to scam tourists into a tour or with the lucky Buddha incense. They tell you the money from the incense is going to the monks and the upkeep of the temple… it doesn’t.